Potluck Collective provides an intimate and welcoming space for artists to showcase their work in small and relaxed one off events. Potluck has been created to promote collaboration and appreciation for all creative mediums with cross pollination encouraged. Here you will find collections we've put together from contributing artists and developers and games we made as a group for exhibitions and parties we've held. We jumped into 2019 with a splash and explored earths final frontier. 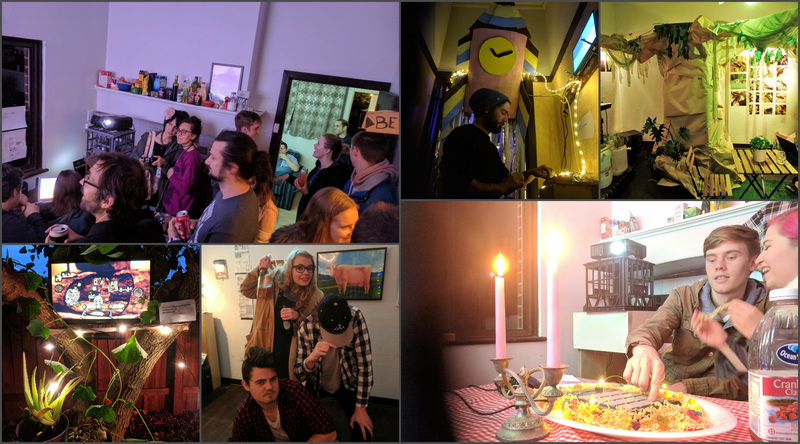 So grab you're snorkels, eat your Gillyweed and jump in your submarine here a few of the games we exhibited at Potluck 8.0! A point and click adventure game about getting into an aquarium and finding some dolphins.